Measurement Computing’s popular, high-performance USB-1616HS-BNC has BNC connections for secure and easy-to-use operation. 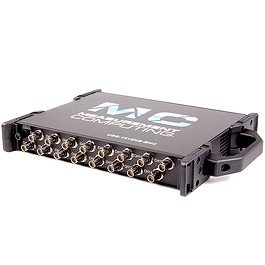 Through its front-panel BNC connectors, the USB-1616HS-BNC provides 16 differential analog inputs with 16-bit resolution. It offers seven software-selectable analog input ranges of ±10 V, ±5 V, ±2 V, ±1 V, ±0.5 V, ±0.2 V, and ±0.1 V.
Through its 37-pin DSUB connectors, the USB-1616HS-BNC provides two 16-bit, 1 MHz analog output channels with an output range of -10 V to +10 V; 16 high-speed lines of digital I/O; two timer outputs; and four 32-bit counters. The USB-1616HS-BNC provides up to 4 MS/s scanning on all digital input lines1. You can operate all analog I/O, digital I/O, and counter/timer I/O synchronously.